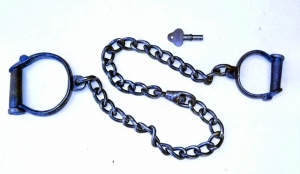 This is a rare version of an Adams with a chain similar to a Phelps instead of the more familiar three rings. There are no markings. 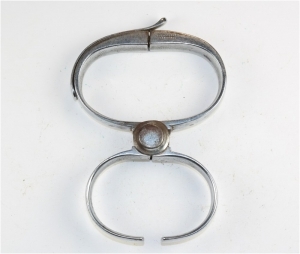 A rare Adams cuff mounted on a swivel instead of the familiar three rings. No markings. This is a standard Darby from an otherwise unknown company. Another example is shown in the Nichols book. William Baker of New Town Row, Birmingham is listed in an 1816 Birmingham Directory. 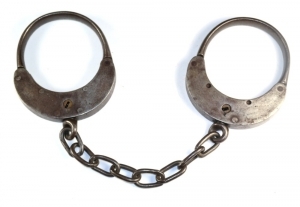 A rare cuff. The Bean Giant was patented in 1887 by E. D. Bean. 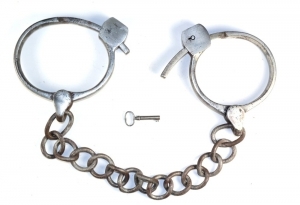 It was a very secure cuff, difficult to open even if the prisoner was holding the key. 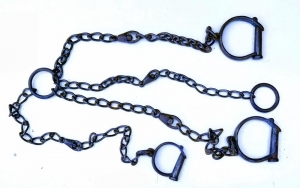 This is a rare neck collar with attached handcuffs. 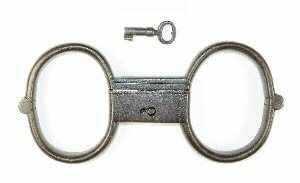 A standard Darby marked for R. Blunn & Co. Nothing is know about this company. 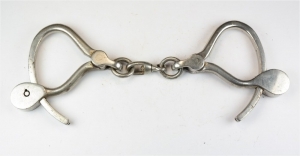 The Carberry is an revised version of the Cummings handcuff made by the Dawson Machine Co. Patented in 1912. 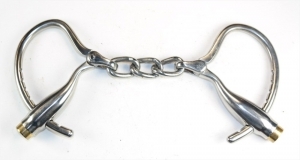 This is a beautiful plated example of a Caveney Bottleneck handcuff. 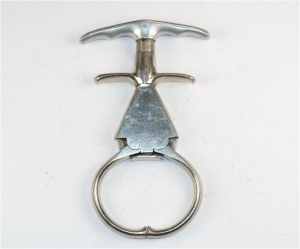 Patented in 1912 it was essentially a copy of the Marlin Bottleneck. This Darby is marked Charlton's Warranted Wrought. 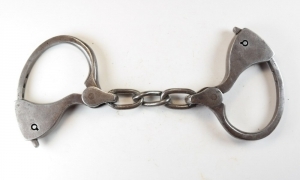 The Delestatius was the second handcuff to be patented in the US, back in 1861. 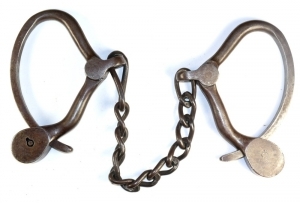 The Eisaman & Rome Nipper was patented in 1906. 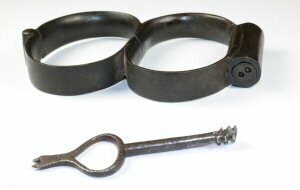 Elijah Rickard was a member of family of locksmiths from Shepherdstown, West Virginia. 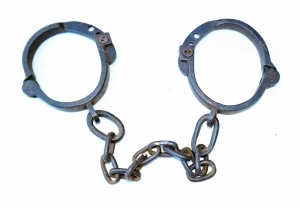 He is credited with making the first branded handcuffs in America. 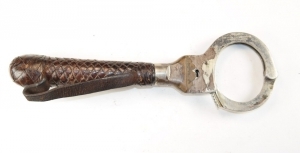 Fenn & Co. Limited of 105 Newgate Street, London was a mid 19th century toolmaker known for lathes. 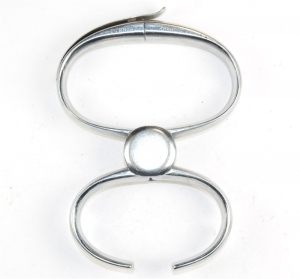 Gill patented his unique cuff in 1930. 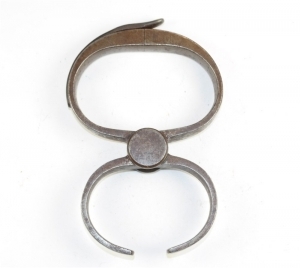 The thumb cuff version of the cuff was much better known. 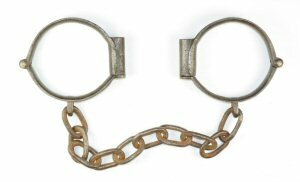 Later versions of the Gill Cuff were know as the Flash Action Manacle. 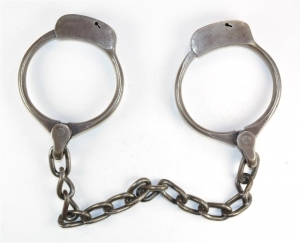 The second version of the Gill Cuff was turned upside down. Patented in 1930. 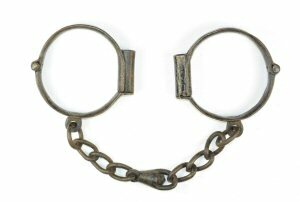 Griffin bar handcuff from the early 19th century. 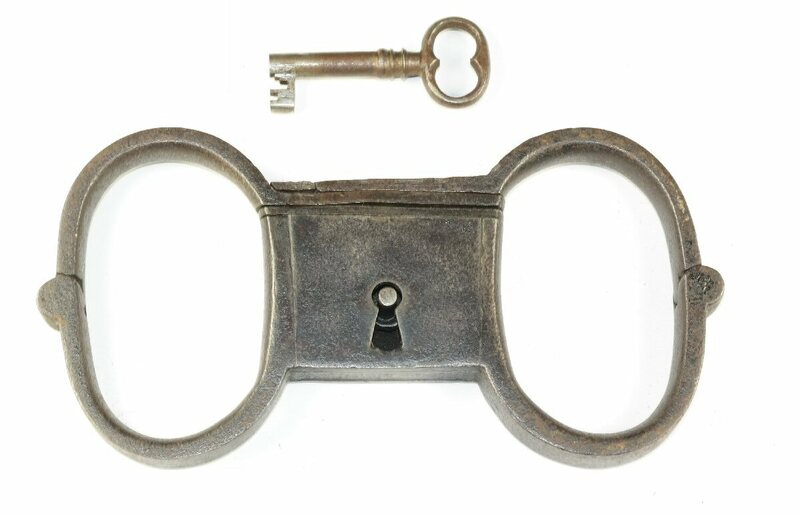 This is a very nicely constructed cuff made by the founder of the British handcuff industry. 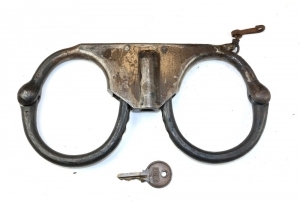 A rare and valuable handcuff. 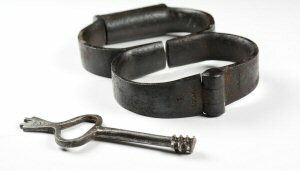 Hiatt bar handcuff from the early 19th century. 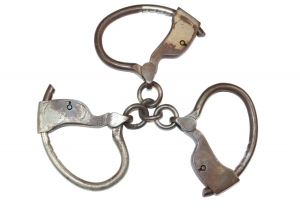 This handcuff was made by Thomas Hiatt and is similar to the Griffin bar handcuff. 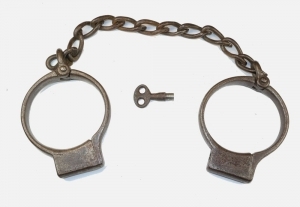 A rare and valuable handcuff. 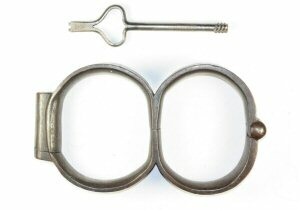 This is a rare example of a Hiatt locking nipper. 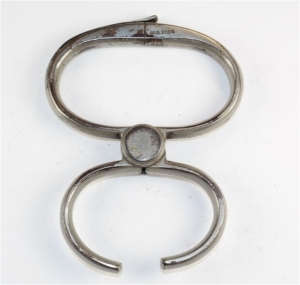 To open the cuff the screw must be turned in. It is difficult to operate. 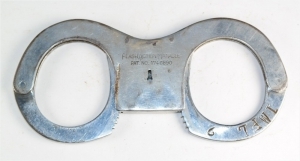 The Hiatt Reliant is a rare cuff from the early 1950s. Not many were sold, likely because the wheel mechanism worked so poorly. 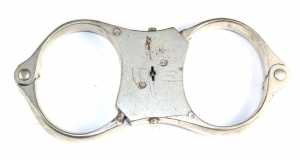 This cuff is a super rare version of the Hiatt Reliant. 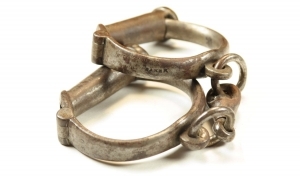 The Reliants were unusual cuffs from the early 50s. They locked with a wheel and cog mechanism. HIatt Side snap eight. 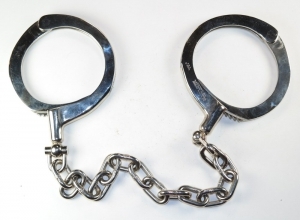 A rare cuff. 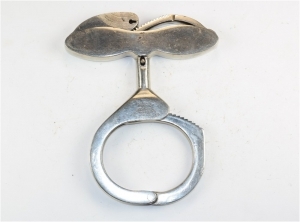 This one opens with an unusual screw instead of a key. Screw the key in and the bolt opens. 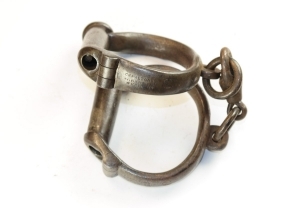 Remove the screw and the cuff is locked. 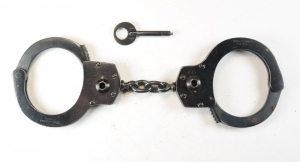 This a Hyatt and Tankersley restraint belt equipped with a pair of Bean handcuffs. 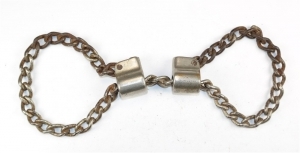 The belt was patented in 1888. 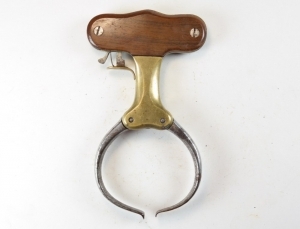 The Lutz nipper with its wooden handle is one of the most beautiful cuffs ever made. 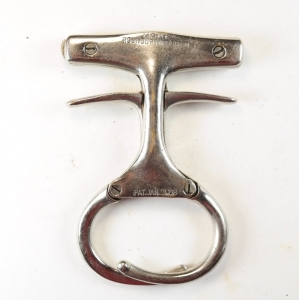 The Maltby nipper made by Mattatuck is one of the most complicated and least reliable cuffs ever made. 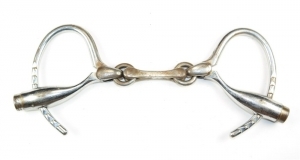 This Marlin Daley has a very unusual dog bone linkage. 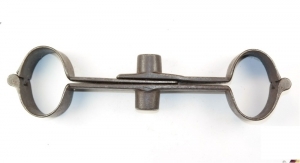 Nettleford was a hardware manufacturer known primarily for woodscrews. 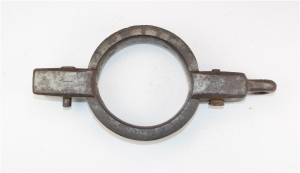 This unusual Darby has a C&M marking. 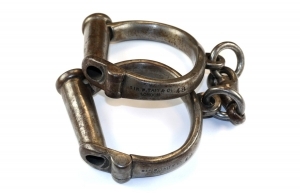 The Phelps is a high quality heave handcuff from the 1860s. It was the prelude to the popular Tower line. 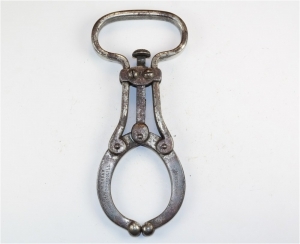 This is a early Phillips nipper. It is a close match to the original patent. 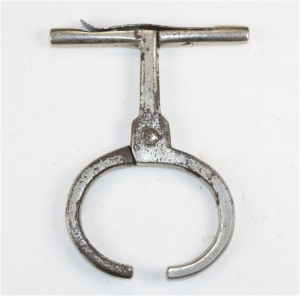 The Powell nipper was patented in 1945. 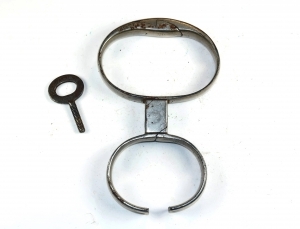 The Pratt combination nipper acts as a standard nipper, but also unfolds to form a handcuff. Patented in 1916. 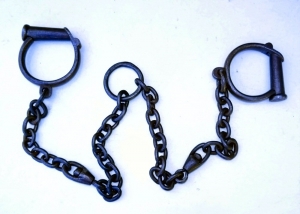 The Pratt combination nipper acts as a standard nipper, but unfolds to form a handcuff. This is the 2nd model. Patented in 1932. 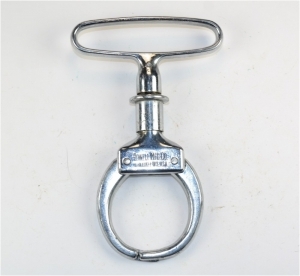 The Round Up Nipper Company was located in Montana. 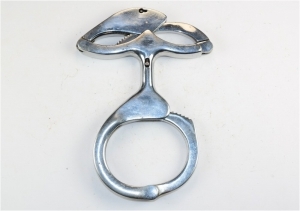 Patented in 1908. 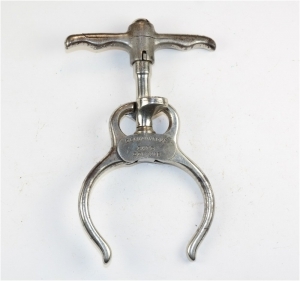 The Shear nipper was patented in 1884. Sir Peter Tait was a merchant and member of Parliament. He sold uniforms and other equipment to the army. This unique nipper serves a dual purpose as a bill club. 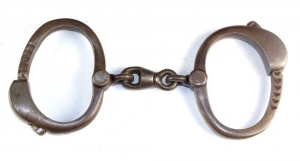 The cuff is a Peerless. Patented in 1931. 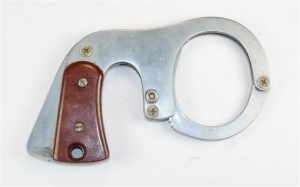 This combination billy club and nipper was patented by Stull and Kennedy in 1931. 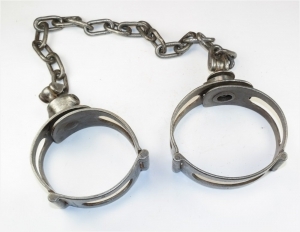 The cuff is an early model Peerless. Thewlis & Co was located in Warrington. Thewlis & Griffith was located in Warrington. 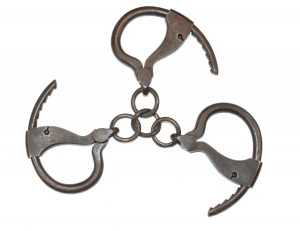 This is a Tower Three-Way handcuff. 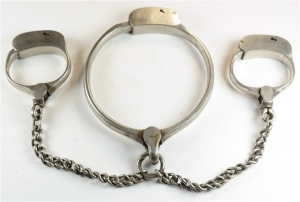 This is a rare Tower single locking three-way handcuff. 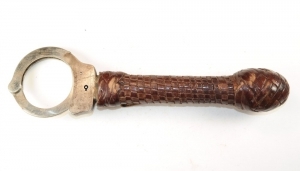 This is an unusual grip that has a pistol grip. Squeezing the lever ratchets the bow closed. 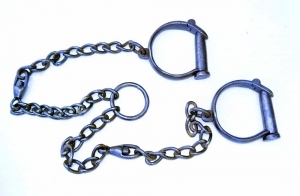 The Walden is a very light weight, almost toy like, handcuff patented in 1918. 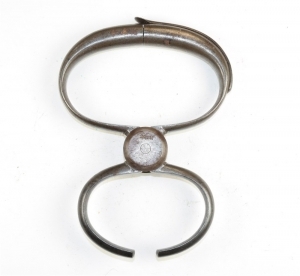 A rare cuff by James Walley of Great Bridge, Tipton, Staffordshire. Listed in the 1835 Pignot Dirctory. 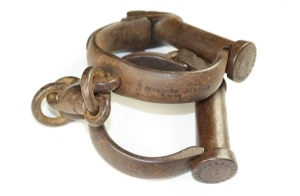 A very rare cuff. 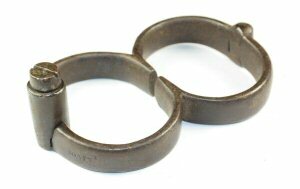 A Darby handcuff by an otherwise unknown company. Just do not call it Wells Fargo. 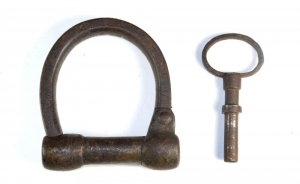 Wilson is an unknown company from the early 19th century. 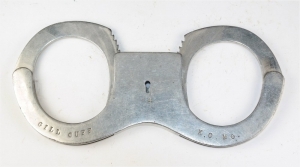 This is a rare cuff. One is in the Blaise Castle House museum. A couple of others have been seen on eBay. 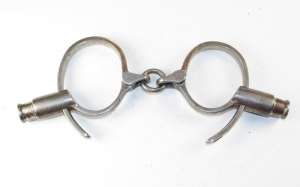 The Wisner and Hoyt is a rare handcuff patented in 1869. 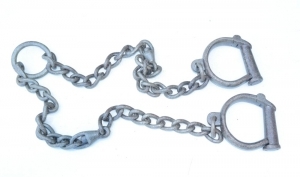 This is an early model of the Wood chain handcuff. 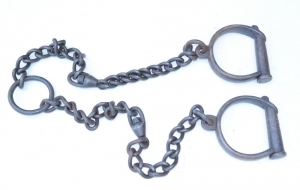 The Wood chain handcuff was patented in 1913.